NEW 30, 40, and 50 lb. Test 300 Foot Spools Are Available Pre-marked Every 50 Feet. Our solid soft stainless steel trolling wire is the economical choice. 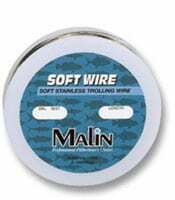 Malin Soft Stainless is excellent for all types of trolling in both fresh and saltwater where depth control is needed. It is resistant to abrasions and corrosion. Malin Soft Stainless is available in 10 lb. test through 125 lb. test and is packaged on spools of 300, 450, 600, 1,000 and 1,200 feet and spools of 5, 10 and 30 pounds. (See Reel Capacity Chart) The standard alloy is 302/304. For additional corrosion resistance, type 316 alloy is available upon request. Our solid soft monel trolling wire possesses superior properties that make it the ultimate trolling wire for fresh or saltwater. These properties give it exceptionally good resistance against kinking, corrosion and abrasion. It sinks faster and stays deeper than soft stainless steel due to its high density. 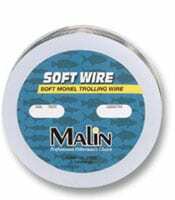 Our Soft Monel trolling wire is the number one choice among experienced wire line anglers. It is available in 10 lb. test through 100 lb. test and is packaged on spools of 300, 450, 600, 1,000 and 1,200 feet, and spools of 5, 10 and 30 pounds (See Reel Capacity Chart). the amount of wire required to fill the reel.